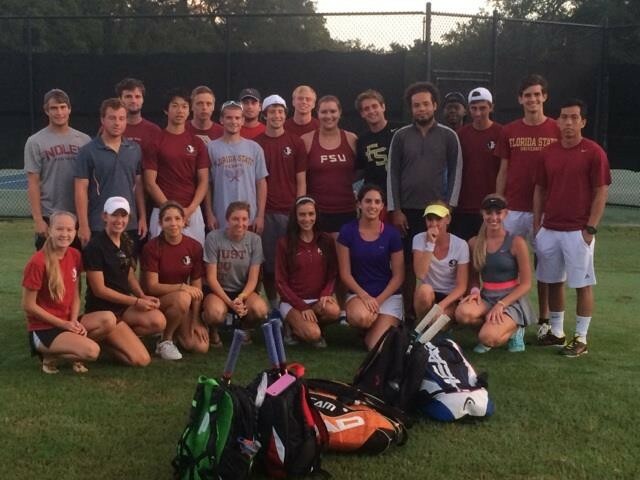 FSU Tennis is using Smore newsletters to spread the word online. On September 27-28 Florida State University Tennis Club will be hosting the FSU Challenge USTA Tennis on Campus tournament. Pleas email fsutennisclub@gmail.com by Sunday September 21 with how many teams you will be bringing. Due to our court restrictions we will only be taking a max on 24 teams. So all schools can bring up to three teams with the exception of UF, UCF, and USF who can bring four since they all went to nationals last year. It will be $35 per team, shirts and bagels provided. If you have any questions feel free to email or call/text Sam Roy at 862-216-5006. Each set will be played to 6 games with no AD scoring, with a tie breaker played at 5-5 (sudden death point at 4-4). The winner of each round will be the team that wins the most amount of games. This tournament allows substitutions during the sets. Each player is allowed to play a maximum of 2 sets; therefore, each team must have at least 2 men and 2 women. A 5 minute warm-up will be given before each match. On the first day, there will be pool play and on the second day there will be bracket play. Also in the email you send can you send the names and phone number of each team captain and how many of each size shirt you will want so I can have those ready. We also have created an event page where all tournament information will be posted on so that all players will be able to see everything. Please add all players attending to this event.